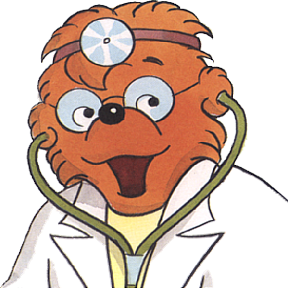 The Berenstain Bears’ Hospital Friends is scheduled for publication by HarperCollins in April, 2015. It describes the Bear family’s trip to the Bear Country Hospital to visit Brother’s and Sister’s cousin who just had his tonsils out. Once there, their family doctor, Dr. Gert Grizzly, gives them a guided tour of the hospital’s facilities and introduces them to all the folks who make the hospital go—doctors and nurses, technicians and administrators, emergency personnel and more. The book’s publication is a non-profit undertaking by the author. All royalties will be donated to a children’s health foundation. The Berenstain family is creating the Stan and Jan Berenstain Healthy Kids Foundation for this purpose in Stan and Jan’s memory. The foundation’s mission is to fund children’s health initiatives ranging from health education measures, such as fighting childhood obesity, through improvement of specific hospital facilities, to basic medical research. The foundation has been set up from the outset with the intention of qualifying to become a public foundation giving it more operating flexibility and maximizing its potential for growth and increased funding. Its board of directors consists of three Berenstain family members, Laura Berenstain (Dr. Laura K. Diaz, MD, The Children’s Hospital of Philadelphia, Department of Anesthesiology and Critical Care Medicine, Attending Anesthesiologist), Mike Berenstain, his daughter, Sarah Berenstain, an elementary school teacher and two non-family members with a medical background, Dr. Alan Jay Schwartz, MD, MSEd, The Children’s Hospital of Philadelphia, Director of Education, Director, Pediatric Anesthesiology Fellowship Program, Attending anesthesiologist and Dr. Lynne G. Maxwell, MD, Associate Director, Division of General Anesthesia, Associate Professor of Anesthesiology and Critical Care Medicine, Perelman School of Medicine at the University of Pennsylvania. Close collaboration with CHOP has been pursued in researching the book and in publicizing its creation and distribution. Mike has visited the hospital multiple times to take notes, sketch and conduct interviews including visits to the OR where wife, Laura, was the anesthesiologist. The sketches Mike made are being used to create the illustrations of the book. The content of the book has been reviewed by Laura and the other medical directors of the foundation for accuracy. Close collaboration has been ongoing between CHOP and HarperCollins in publicizing and marketing the book. CHOP’s role will be acknowledged in the book and it is planned that CHOP’s will be credited on the book’s cover and in all publicity materials. The book, foundation and CHOP’s role will be featured on the Berenstain Bears’ website. The foundation will also create its own website.